Nick’s family has been on the run from magicians his whole life. His father is dead, and his insane mother hates him—she starts screaming if he touches her. 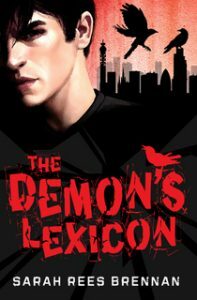 After Nick’s protective older brother is marked with a demon sign that means death, danger is unavoidable. The only way to erase the sign is to kill a magician. As Nick and his brother play a deadly cat and mouse game with the magicians, Nick begins to suspect that everything his brother has told him about their past is a pack of lies. Not knowing whom to trust or where to turn, he walks into a trap—and a startling revelation that changes everything he’s ever believed. Sixteen-year-old Nick and his brother, Alan, are part of a secret world. They go every month to a Goblin Market where magic is bought and sold, and they are always ready to run from the deadly magicians who use demons to work their magic. The magicians want a charm that Nick’s mother stole—and they want it badly enough to kill.